Photo by Bryan Stevens • A flock of vultures gathers in a dead pine tree on a gloomy winter afternoon. Cougars have returned to eastern mountains, white-tailed deer numbers are out of control and hungry black bears sometimes wander into towns. Encounters between humans and wildlife are nothing new. I was reminded of this fact when I received a recent email from Gene Sturgeon on the subject of vultures. Gene and his wife, Catheryn, reside in Abingdon, Virginia. The town, it would seem, has experienced a recent invasion. 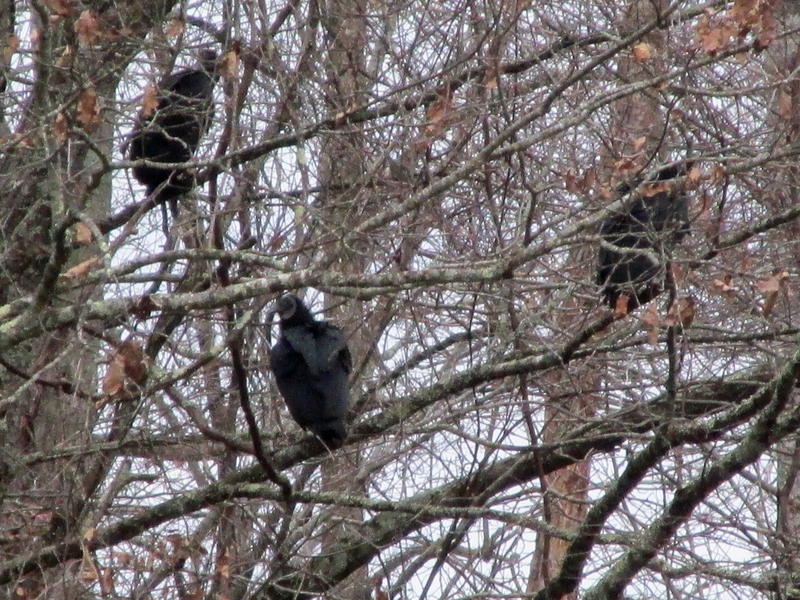 Gene has also observed that the black vultures, starting in mid-afternoon, begin to gather in selected trees. Usually two nearby trees, he noted, will contain dozens of them for the night. Photo by Bryan Stevens • Vultures gather atop an industrial building in downtown Erwin, Tennessee. Gene asked if the behavior he has observed is fairly typical. I replied to his email that I believe that his observations are accurate and typical. 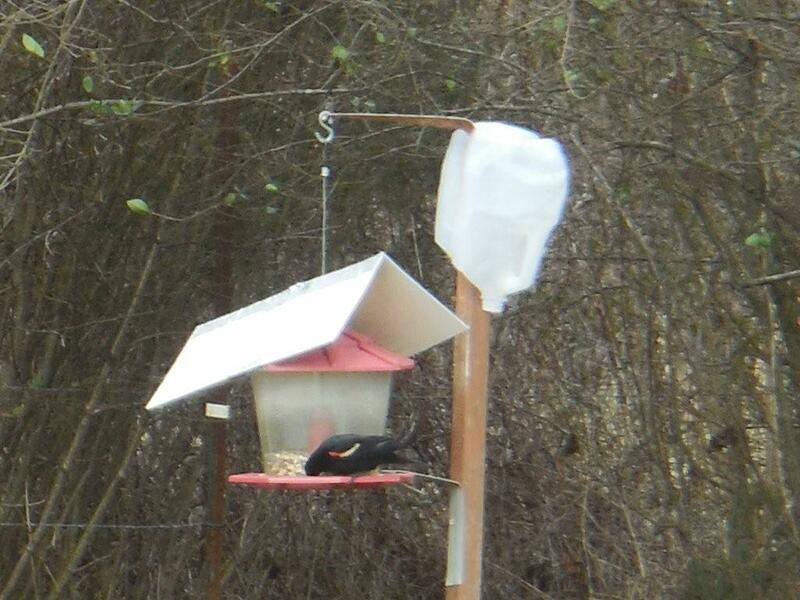 While the birds seem to be roosting in his neighborhood, they are probably not finding their food there. Vultures are capable of soaring long distance in search of food, so they may actually be dining far away from Gene’s Abingdon neighborhood. Photo by Bryan Stevens • A turkey vulture perches on a branch in a South Carolina woodland. I asked him if there were pine trees or other types of evergreens because it’s my understanding that vultures are often fond of thick stands of pine. I am guessing this is because such trees offer protection and shelter from the elements. Gene wrote back to inform me that both pine trees and leafless trees are present near his home. “The leafless tree attracts the larger cloud of black vultures,” he added. Doubtless, some residents are uneasy when these uninvited neighbors swell the neighborhood. I was somewhat surprised by Gene’s observation, but I was also taken aback to learn that Abingdon has for years boasted an extremely substantial population of vultures. In fact, the Abingdon Police Department has even compiled a fact sheet to educate the public about these large birds. According to the release, it is around this time of year that Abingdon sees an increase in the number of vultures due to weather patterns. The APD has apparently received complaints from some citizens about the vultures roosting in their neighborhoods. 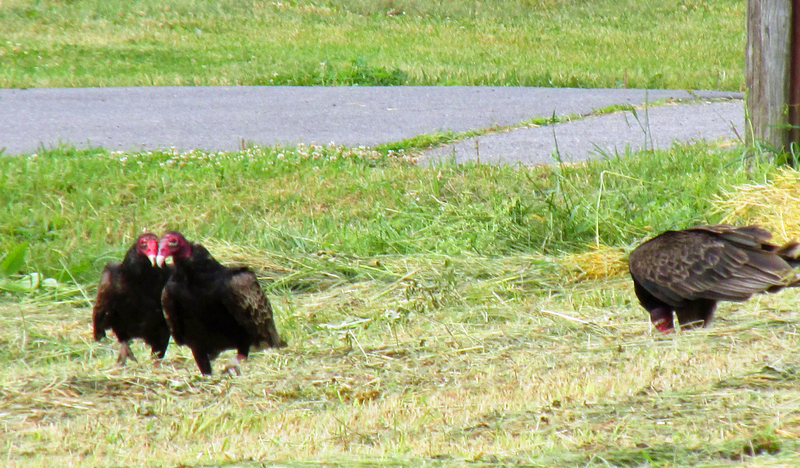 Photo by Bryan Stevens • Turkey vultures forage in a freshly mowed field near Abingdon, Virginia. As scavengers, vultures play a vital but often unappreciated role in the environment. I was glad to note that the fact sheet recognizes the important of vultures in the ecosystem. These large birds serve an important function. Without vultures, local yards and roads would be littered with rotting, stinking, animal carcasses — and the health risks that accompany them. Nothing prohibits a private land owner from contacting a professional wildlife specialist to disturb the roosts at owner expense. If I might offer unsolicited advice, however, I’d recommend against wasting your money. The tactics, while they may make a temporary difference, don’t usually solve anything in the long run. 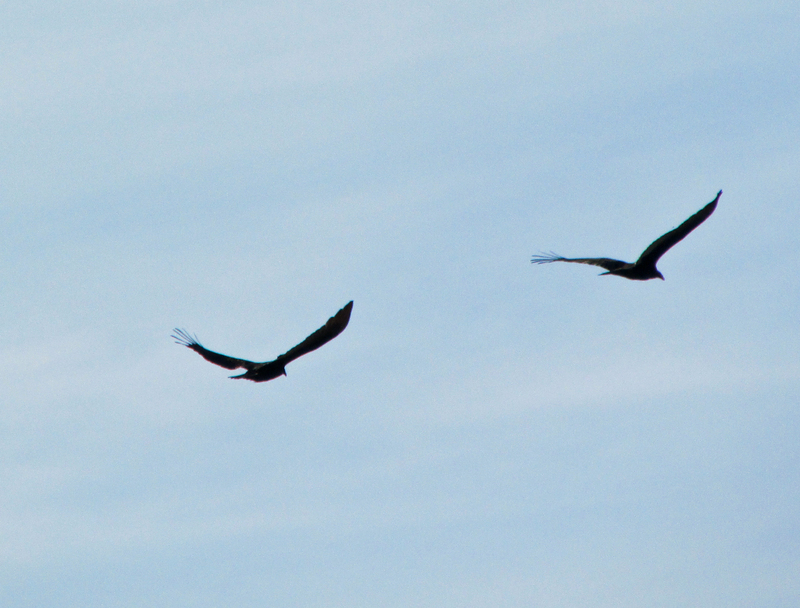 Photo by Bryan Stevens • Turkey vultures in their usual V-shaped silhouette characteristic of a soaring vulture. Abingdon’s government, for both ethical and legal reasons, cannot kill vultures. Private citizens are also forbidden by law to kill vultures or hire exterminators to do so. Vultures are protected by the Migratory Bird Treaty Act. The birds, their nests and eggs cannot be killed or destroyed without a permit from the U.S. Department of the Interior’s Fish and Wildlife Service. Private citizens are also not legally permitted to use fireworks to try to disperse vulture flocks. • Ensure that you are not inadvertently attracting the vultures. Common attractions include open containers of pet food, uncovered garbage cans, and pet food bowls. 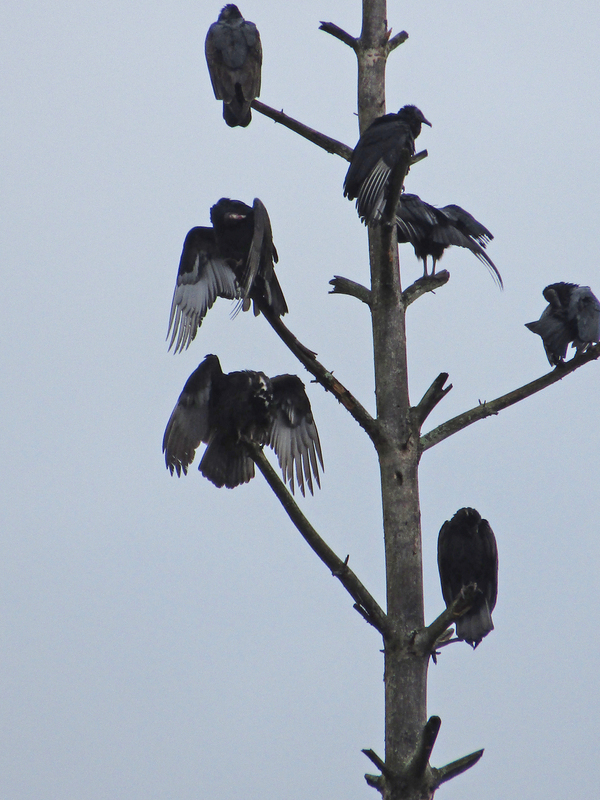 • Remove any dead trees that make convenient perches for vultures. 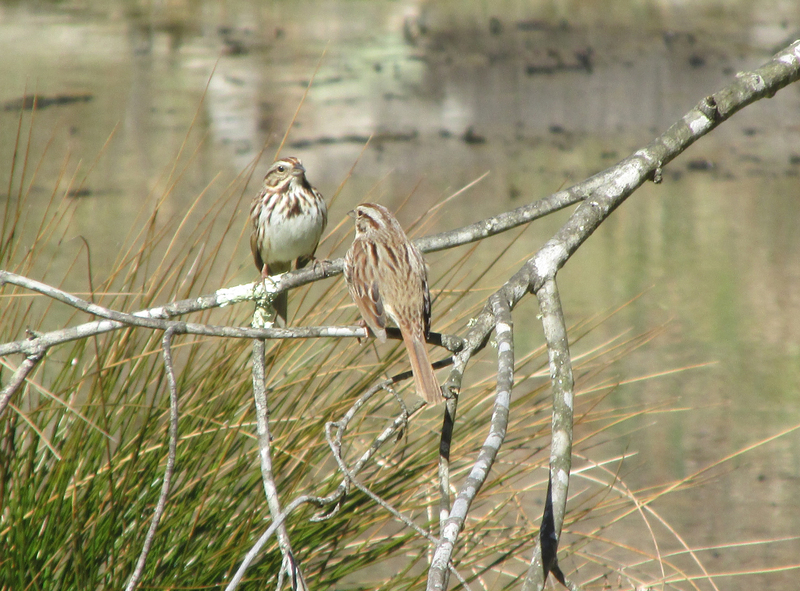 • Use humane perch deterrents, like motion-activated sprinklers or lights. 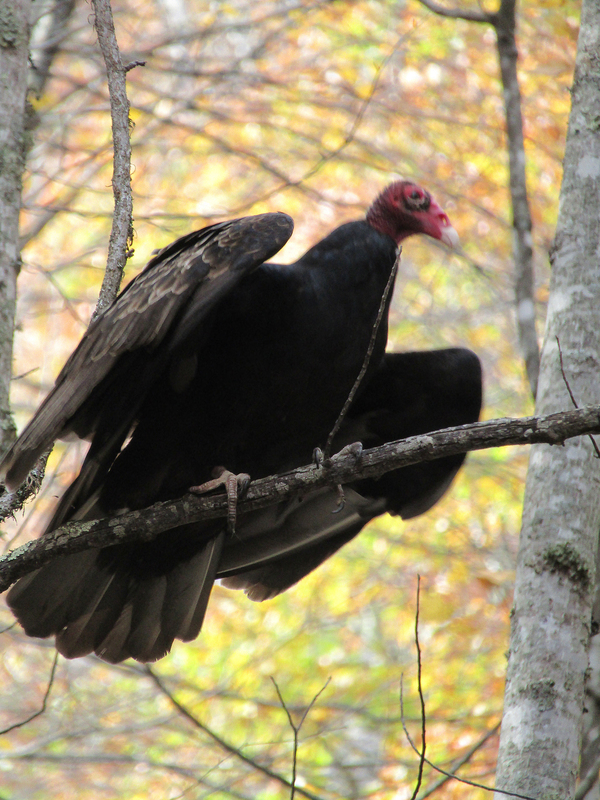 Photo by Bryan Stevens • A Turkey Vulture perches in a woodland in Roan Mountain, Tennessee, during late fall. The APD also pointed those wishing for more information to the Cornell Lab of Ornithology website, which has excellent information about both species of vulture, including conservation information. I was very pleased to see that the APD tried to dispel misinformation about these valuable birds. People are, naturally enough, concerned for their pets because of the presence of these large birds. Vultures are carrion eaters, which means eat animals that are already dead, preferring animals that have been dead for two to four days. 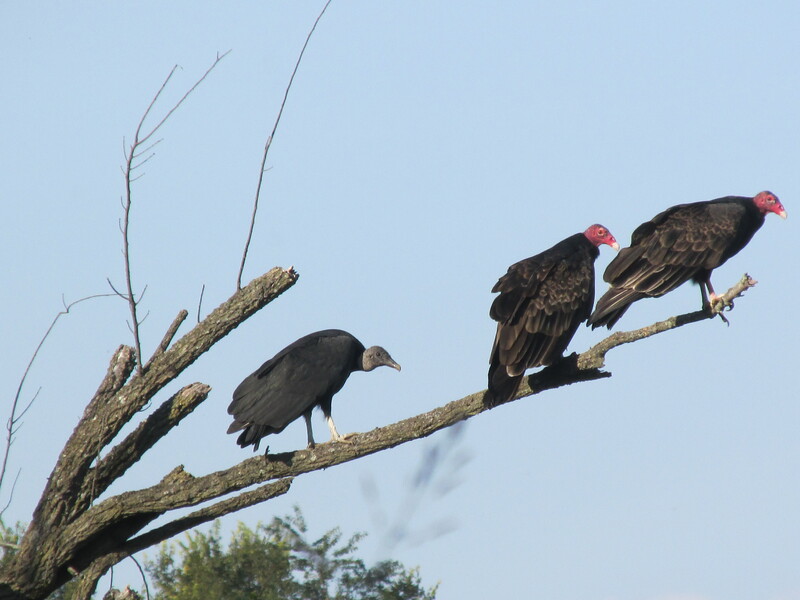 While there are no accounts of turkey vultures preying upon live animals, there have been occasional reports of black vultures preying upon small, live and relatively defenseless animals. That tells most, but not all, of the story. Black vultures occasionally will attack newborn livestock, but these birds are not likely to go after the family dog or cat, especially if the pet is mobile and in good health. Nevertheless, it is still a good idea to keep cherished pets indoors. While vultures pose little danger to them, plenty of other animals, such as coyotes, are much more opportunistic than vultures. Keeping cats and dogs confined indoors also protects wild birds and other wildlife from the instinctive predatory notions of our precious pets. Photo by Bryan Stevens • A black vulture and two turkey vultures share a perch near Boone Lake in Sullivan County, Tennessee. While both vultures are migratory birds, their numbers have always fluctuated and will continue to do so. As their populations increase, their range has increased as well. 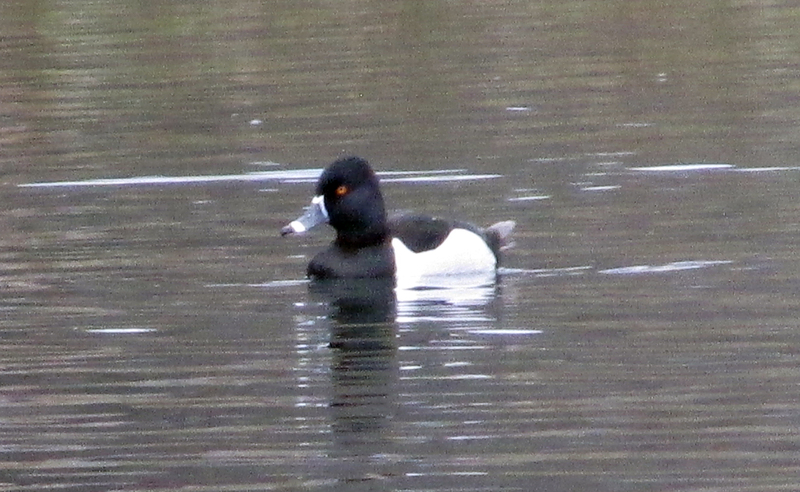 Both species are present in the Abingdon area year-round. Because of the town’s location, their numbers increase from November through early February as they follow the weather patterns. In colder periods, they move farther south, in warmer periods, farther north. 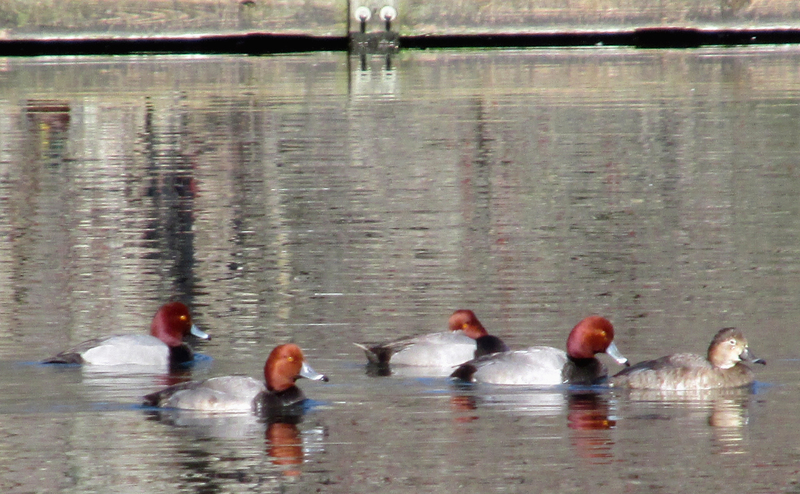 Abingdon’s climate makes for a good wintering location. 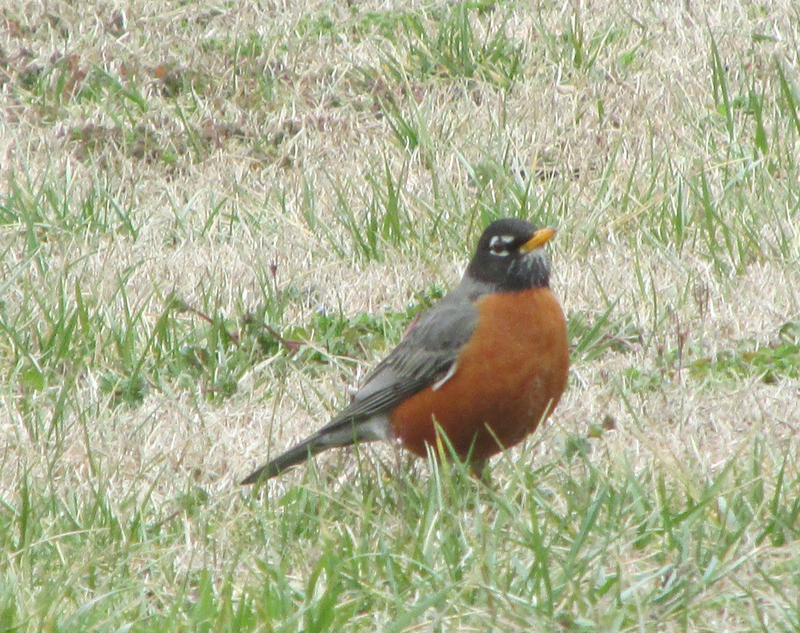 As it gets warmer, non-resident flocks tend to move farther north. Like many other species of birds, some vultures have learned to co-exist near humans, just like such birds as Canada geese, Eastern bluebirds, American robins and mallards. Like these birds, vultures are highly adaptive creatures. Unlike some types of wildlife that shy away from human contact, vultures and some other birds have adapted to the human environment – perhaps a bit too well. Vulture behavior can be destructive. In recent years, some of these destructive tendencies have become quite infamous among birders. 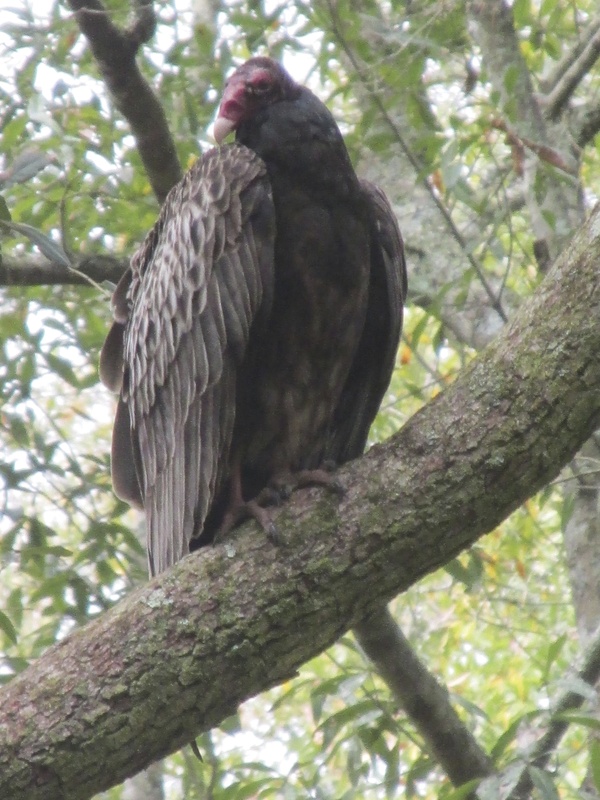 This new behavior apparently first surfaced among vultures wintering in south Florida. 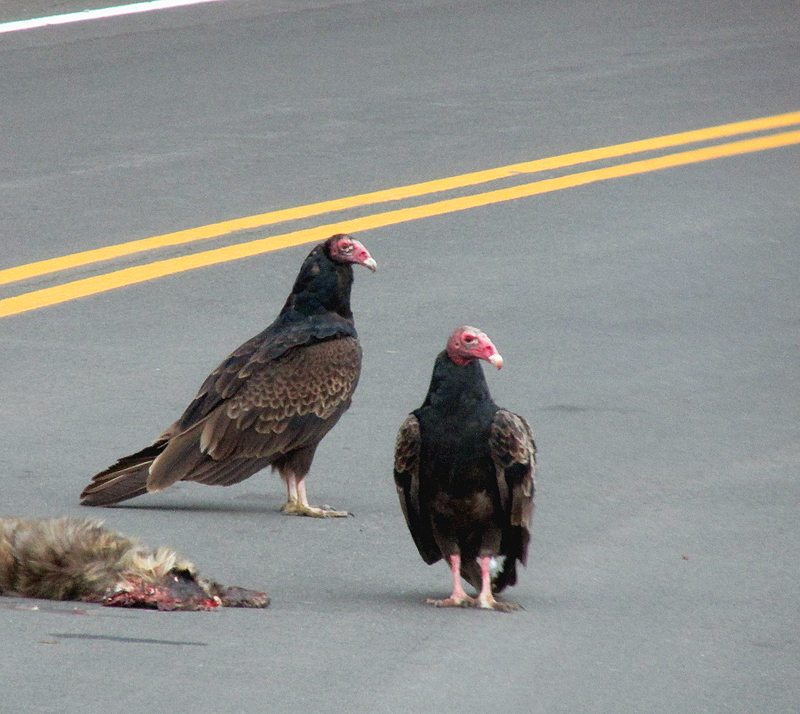 Photo by Bryan Stevens • Turkey vultures regularly dispose of road-killed animals. They have been known to tear window and roof caulking, vent seals, shingles, rubber seals on car windshields, windshield wipers and other soft, rubbery materials. In addition, their excrement is acidic and may damage painted surfaces and landscaping. The birds also regurgitate a smelly, acidic vomit. Unfortunately, vultures apparently pass on these bad habits to others of their kind and such aberrant behavior is now being seen outside of the Sunshine State. 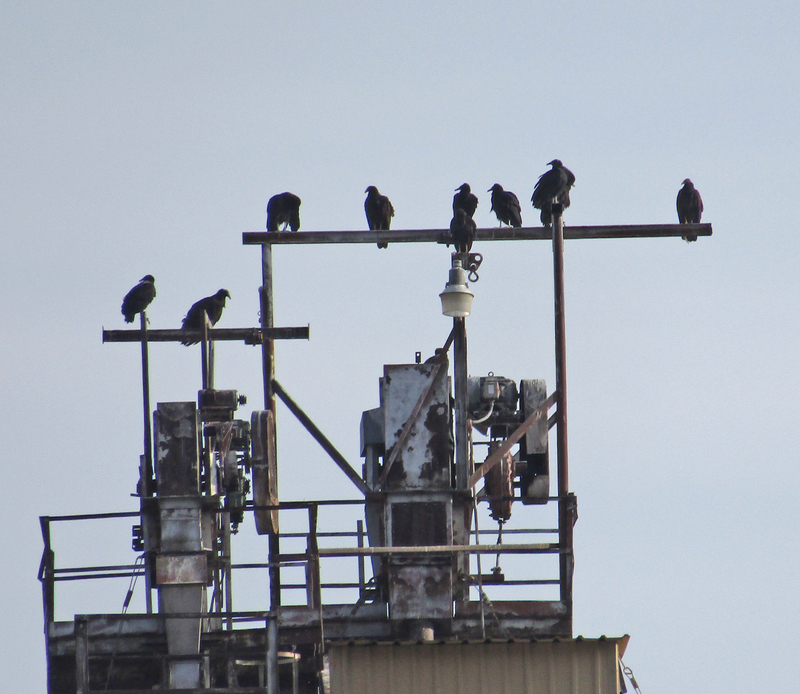 According to the APD, flocks of as many as 100 vultures have been documented in Abingdon. This number may rise and fall, depending on conditions. Vultures are part of the web of life, which connects them and their fellow creatures to our own lives. Turkey vultures are larger than black vultures, weighing about four to five pounds, with a wingspan of six feet. The turkey vulture’s most distinctive feature is its bright red, featherless head. In flight, a turkey vulture often appears to be “wobbling” and, from underneath, all of the flight feathers are light colored. Photo by U.S. Fish & Wildlife Service • Turkey vultures have bare red heads, as opposed to the black heads of the related black vulture. While larger than black vultures, turkey vultures are less aggressive than their smaller relatives. On the other hand, black vultures are smaller, weighing less than four pounds, with a wingspan of five feet or less. The black vulture’s head is grey and featherless, but larger in proportion than the turkey vultures. Viewed in flight, only the outer flight feathers of the black vulture are white. Although smaller in size, black vultures are feisty and aggressive birds. They often outcompete turkey vultures at carcasses. They will also only reluctantly abandon a feeding site at a carcass. My family almost learned this the hard way during a trip to South Carolina when my father almost ran his car into a flock of black vultures feeding on a road-killed deer. I warned him that the vultures might not get out of the way, and he slowed the car’s speed. The vultures hopped back from the edge of the road as our car traveled past them. Looking back, I noticed they immediately hopped back onto the carcass after we had passed. If we had sped past at full speed, one of the bird’s could easily have panicked and flown into our path. A four-pound bird can do a lot of damage if it hits the windshield of a car traveling at 40 to 50 miles per hour. Trust me! You don’t want to put this to the test. Perhaps that’s the moral of the story. Give vultures a wide berth and, in theory, they will do the same for you. Let’s face it. Vultures aren’t going to be cute and cuddly faces for ecological awareness. A polar bear or penguin, vultures simply are not. They still have a role to play, and we should be grateful they were created for just that purpose. This entry was posted in Birding, Birds, black vultures, turkey vultures, Uncategorized, Virginia, vultures and tagged Abingdon, Birding, birds, Birdwatching, black vultures, Bristol Herald Courier, Bryan Stevens, Carter County Compass, Elizabethton Star, Erwin Record, Feathered Friends, McDowell News, Northeast Tennessee, Our Fine Feathered Friends, Songbirds, turkey vultures, Virginia, vultures on March 5, 2017 by Bryan Stevens. I’ve always believed that all birds make good neighbors, although I will admit it’s easier to welcome certain birds than it is others. Photo by Bryan Stevens Black vultures perch together in a tall tree. 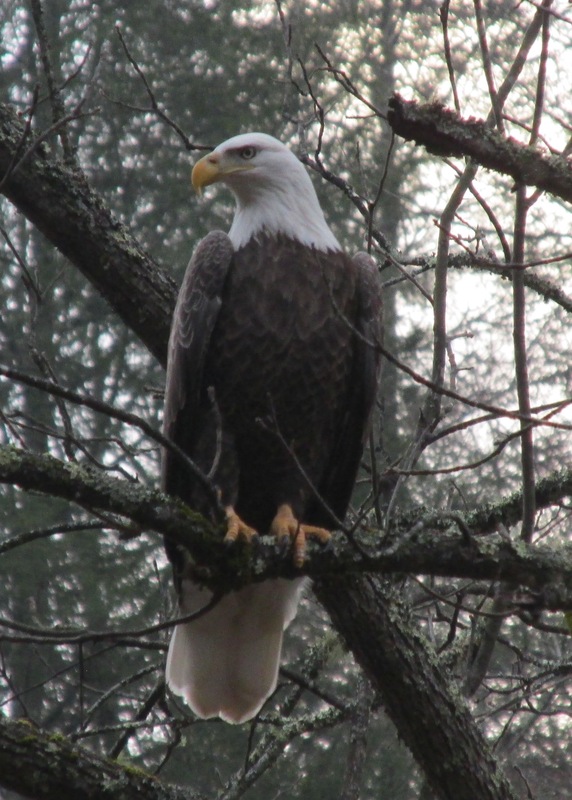 Gene Sturgeon, a resident of Abingdon, Virginia, shared a Christmas Day bird observation he made. He wrote that a distant tree (maybe 250 yards from the Sturgeon home) held three large vultures. The birds were perched high in the tree, with their wings outstretched as if they were drying their wings. 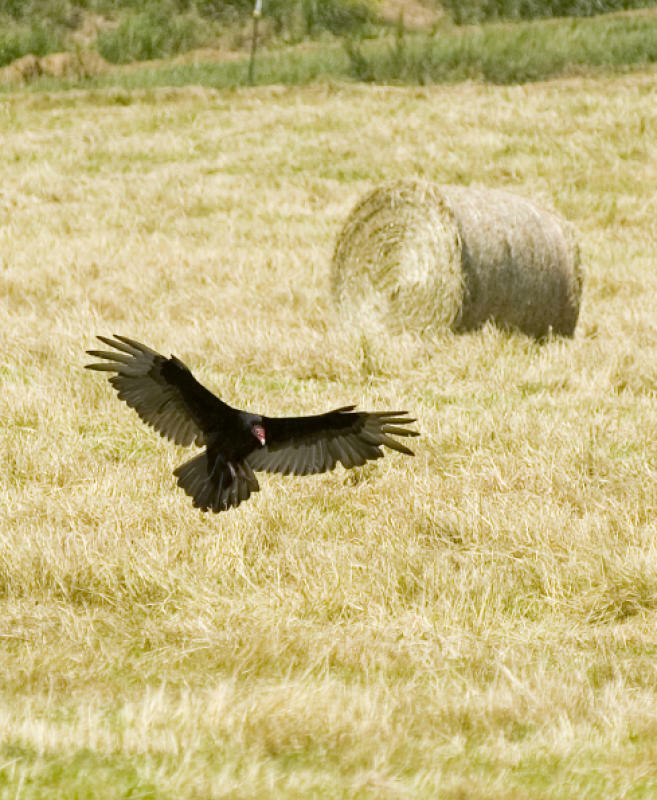 A turkey vulture lands in a pasture. In my response to his email, I told Gene that he had hit on the reason the vultures are there in his neighborhood. The tall tree offer them a perfect perching spot. Sometimes they will spread their wings out in that pose to soak up sunshine. The warmth from the sun’s rays sort of helps re-charge them. By maximizing the surface area of their bodies, morning sunshine can more easily warm them and get them ready to start the day. Basically, vultures are perfect examples of “green” energy in action. 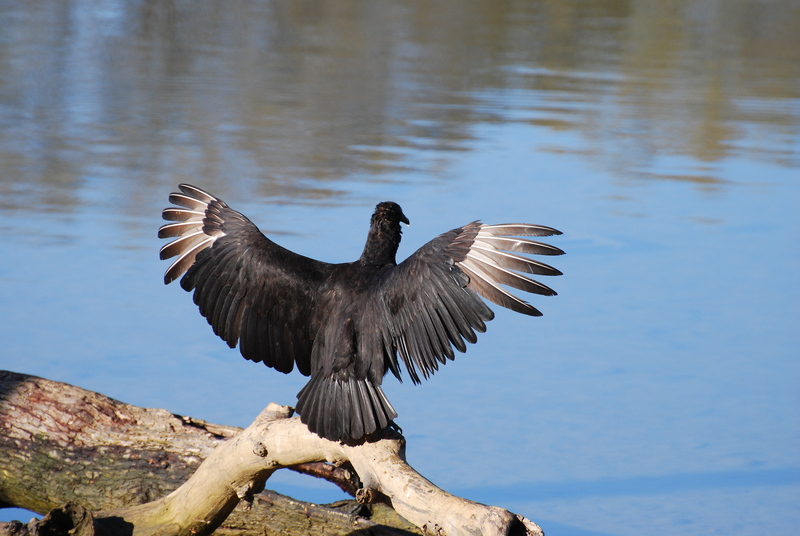 Photo by Jean Potter A black vulture spreads its wings to bask in the warm sunshine. The pose described by Gene is actually one I have seen from time to time in other larger raptors. I’ve seen bald eagles perched with that sort of pose. I also informed Gene that his son was right. Turkey vultures have the red heads, and black vultures have black. The heads of both vultures are bare of feathers, which would quickly become soiled from the habit of these birds of pushing their heads into the carcasses of dead animals when feeding. Gene wasn’t the only person who has sent me an email recently on the subject of vultures. Bettie Hite emailed with some questions she and her husband, Jim, have about vultures in their neighborhood along King College Road in Bristol. Photo by Bryan Stevens Turkey vultures are one of the few birds with a well developed sense of smell. 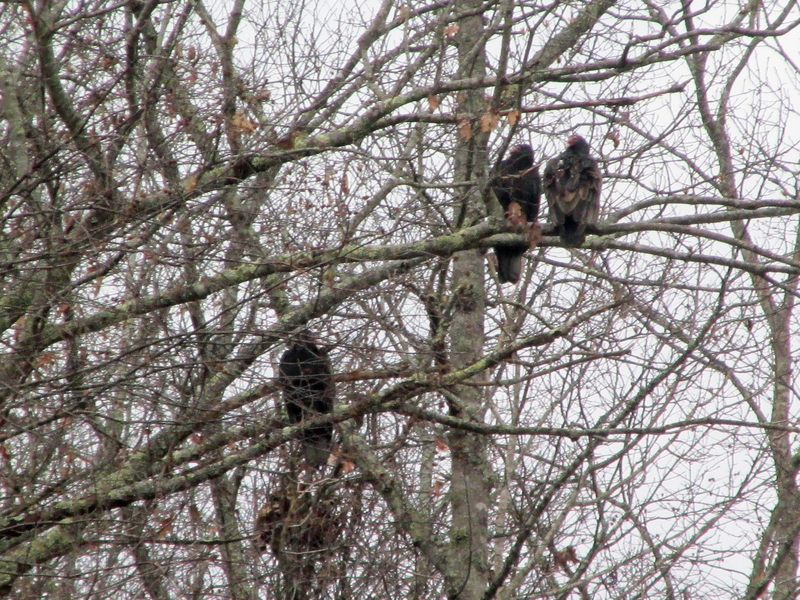 On the morning of Dec. 14, Bettie informed she counted 32 vultures in a maple tree on Carmack Circle (in Graystone) and six more vultures on the rooftop next to the tree. She noted that the vultures dispersed soon after that. Photo by U.S. Fish and Wildlife Service The red head of an adult turkey vulture distinguishes it from adult black vultures. Vultures are year-round residents in the region, and they are sociable birds that tend to form flocks. 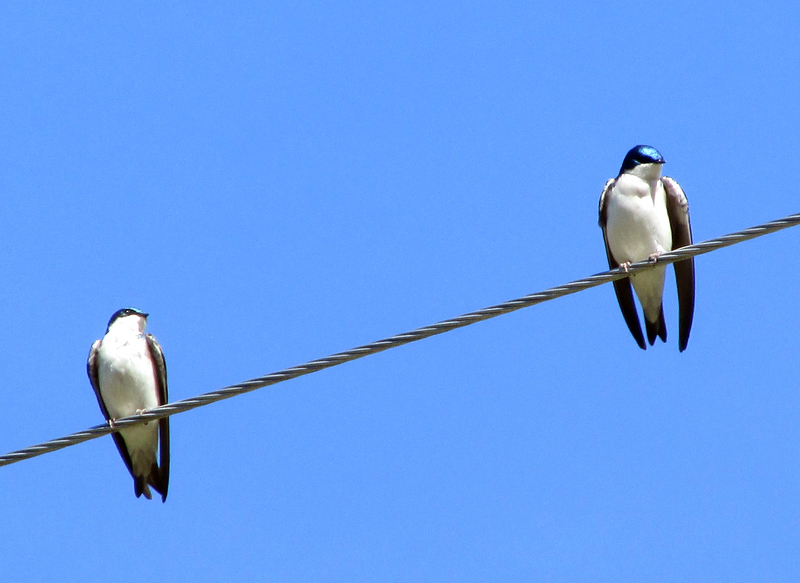 They are also very efficient birds, and they can soar lazily in the sky until they find something to eat. This time of year, vultures scavenge a lot of the remains of deer dressed and left behind in the woods by hunters, but they also are quite skillful at making use of roadkill. They can fly long distances to look for food without actually depleting energy reserves. For the most part, they’re harmless. If dozens grow to hundreds, the resulting mess at the roost could conceivably be a health concern. Why have they chosen to roost in the neighborhood where Bettie and her husband reside? That’s more difficult to answer, but I suspect that the trees in the neighborhood are extremely attractive to this particular flock of vultures. Photo by Bryan Stevens A turkey vulture perches quietly on a tree branch. Turkey vultures are probably more common than black vultures, but I have seen both turkey and black vultures around Bristol. They’re never going to win any beauty contests, but vultures do actually provide a very useful function in the environment. 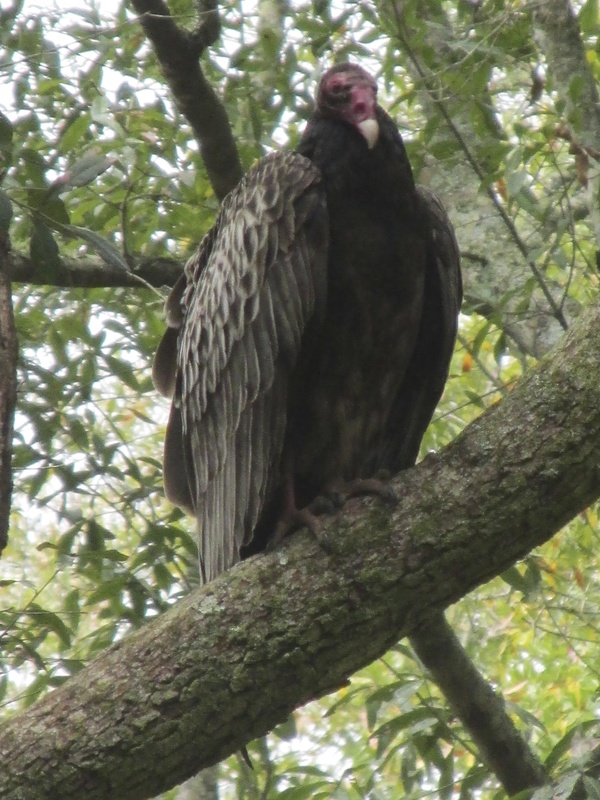 When it comes to finding carrion, turkey vultures also have an advantage over black vultures. Turkey vultures are one of the few birds with a highly developed sense of smell, which helps them identify the wafting scent of decaying roadkill from long distances. As surprising as it may seem, some American towns actually stage annual vulture festivals. For instance, Wenonah, New Jersey, holds an annual East Coast Vulture Festival every March. 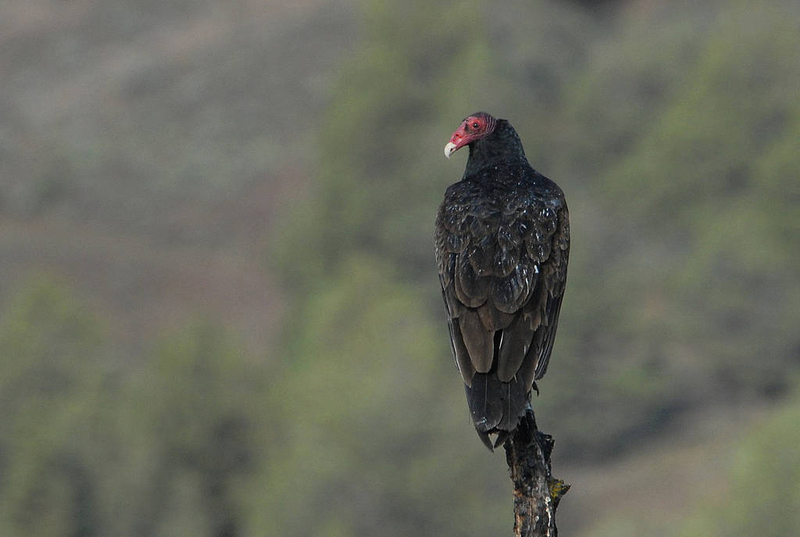 The Kern River Nature Preserve in California hosts a Fall Turkey Vulture Festival every September. Makanda, Illinois, is also considering holding a Vulture Fest this October. Photo by Bryan Stevens A trio of turkey vultures share perches in a large tree. This entry was posted in Birding, black vultures, turkey vultures, vultures and tagged Birding, birds, black vultures, Bristol Herald Courier, Carter County Compass, Elizabethton Star, Erwin Record, Feathered Friends, McDowell News, Our Fine Feathered Friends, The Erwin Record, turkey vultures, vultures on January 17, 2016 by Bryan Stevens.